Published by almostaghost on December 21, 2011 in almostaghost and review. 0 Comments Tags: 2011, 2011 countdown, Lykke Li, Sweden, Ystad. I’ve written about Lykke Li a couple of times on here, and both times I hinted at the general over-produced nature of her albums. And while I still believe that to be true, every time I step back a bit and just listen and take a wide look at Wounded Rhymes, I really dig it. I love her songs and every time I listened, I liked it more, so the album just climbed up my rankings here. 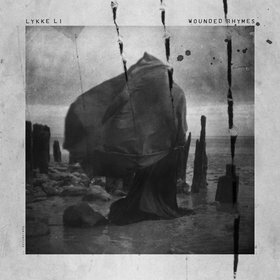 Lykke Li herself calls the songs “hypnotic, psychotic and more primal” (according to Wikipedia), which is probably the best description of Wounded Rhymes ever. The music throughout the album is catchy pop songs, at its core. I dare you not to be left humming along to “I Follow Rivers,” “Rich Kids Blues,” “Jerome,” any of them really. But this pop nature is rarely pure. Everything has a slightly eccentric twist. The driving rhythms are tempered by quiet melodies, flashes of country and rock and dance and ambient flesh the pop songs out. Lykke Li, perhaps unexpectedly, can blend genres as easily as anyone. As for the “psychotic and primal” part of these songs, much of that is in the lyrics. Each song is extremely direct. The songs are always very much in the now. “Once again it’s happening…” she starts on “Unrequited Love.” “I know places we can go, babe.” Later, she flat-up declares, “I’m your prostitute / you’re gonna get some.” Most of the songs are in the present tense, and come off quite urgent. Those depths in the music and the feelings are what kept pulling me back into Wounded Rhymes, one of my favorite albums of the year. Published by almostaghost on March 8, 2011 in almostaghost and YouTube. 0 Comments Tags: Beck, Bon Iver, California, El Perro Del Mar, Los Angeles, Lykke Li, Sweden, Wisconsin, Youtube, Ystad. Here’s Lykke and her band singing “Little Bit” on the street in Stockholm. Pure busking! A guy in the window shouts to be quiet or he’ll call the police. A car drives by. The same guy is converted and throws them money at the end. This one’s incredible. Lykke Li sings, dances, plays the trumpet, and rattles chains while Bon Iver (!) jam on the edge of a fountain. I am not sure why Lykke Li was hanging out with Bon Iver, but they should more. Also apparently Lykke Li plays the trumpet. This “I’m Good, I’m Gone” is not out in public, but it is acoustic and apparently outdoors, so close enough. This one here might be my favorite, and it features Robyn on the chorus! But I can’t embed it, so you have to click over.